"Décatie à maille douce" means something like "faded (or aged) by soft stitch". I know, it sounds weird, but the French are about to elect a reactionary who wants "to liquidate the heritage of May 68 once and for all", so nothing really surprises me anymore. 'Grats on finishing the schoolwork and on the good score! whee haw! great score. i finished my thesis the other day and also went on a thrift store shopping trip to celebrate. great finds. a yarn that has been steamed to give it a matt, soft, finish. Congratulations on both your finished school work and your thriftscore! Congrats on finishing the coursework! The yarn is such a pretty color, too. Congratulations! Lots more time to knit now while you procrastinate on writing your thesis, eh? I found some Picaud wool-cotton at the thrift store once and it was GREAT. I dyed it and made a pair of amazingly comfy socks. Congratulations on finishing your coursework! That's great! Congratulations! Both on finishing the coursework and the sweet thrift store score (although I think the importance of one outweighs the other!). Also - what a great score! Why don't I ever find yarn at my thrift store! Congratulations! Being done with coursework is such a great feeling. I should know -- I've reached that point twice in two diff't PhD programs. :-) Still plugging away at my last prelim, though. 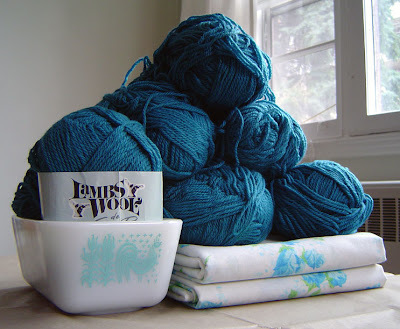 The blue yarn is lovely, and I love those old Pyrex dishes. They remind me of big dinners at my grandma's house when I was little. congrats! what a huge accomplishment! lucky find with the wool. such a pretty color! Congrats on finishing all your classes. It's a great relief, isn't it? You will never take a class again! Yay! congrats on finishing! you must be so happy! Hooray! Enjoy your freedom. I'm completely tantalized by the idea of celebratory thrift-shopping...that's enough to motivate me to get back to the thesis. The Promise of Pyrex! Score! Well it sounds like you got the gist of the meaning. Google translation is "Steamed has soft mesh." Okay, that label officially replaces Blue sky Alpacas as the "Best Disembodied, Floating Animal Head on a Knitting Label Ever". And such a pretty colour too! Congrats on the completed coursework, I hope the rest of your academic pursuits go as well. Go Brainylady! I admit to being a bit jealous-- you've finished up a master's and the doctoral coursework in the time it's taken me to slog thru my master's. I finish my coursework at Thanksgiving. I can think of no better way to celebrate than with yarn. Mazel tov! The French puzzle amused me and sent me off to prove I was right about something last night ("argent" on the periodic table is OF COURSE "silver" because it means "money" in french. I only remember things by chain of connection.). Now to summarize my tangent... congratulations again! yeah!!! Work finished. And I love the Pyrex dish. My mom has some and I have already told her that they are mine. Woohooo! You obviously have better quality thrift stores there than we have here! Congrats on finishing your coursework. What an accomplishment! Congratulations on finishing your coursework. You know how to be a student, unlike me who is STILL working on my thesis! I am totally jealous of your thrift score. To find that much wool yarn at a thrift store in SF would be a miracle. I look forward to seeing both blustery #1 & #2. I used to have blue-rose sheets like those! I loved them. Congratulations on finishing your PhD work! What an accomplishment! You deserve a nice blue vest, for sure. What a score! That yarn is so beautiful - such a rich color! I hope it knits up well! hey, congratulations, Alison! I remember finishing my PhD coursework and how awesome that felt. It's such a great feeling knowing you'll never have to take another class (not unless you want to, of course) - and that you'll be teaching them instead. You are such an inspiring thrift-store shopper - you find the best things! Congratulations on both finishing the coursework and the fab yarn find. Very, very happy for you! Congratulations on finishing the coursework. I'm commenting here while I should be finishing my own. Five more days! How have you found your first PhD year? Where do you find yarn at thrift shops??? Are the special craft thrift shops? Oh I wish we had something like that in the USA! Wow, that is a great score! Bravo! Just started reading your blog, and had to say congratulations! What an achievement!! 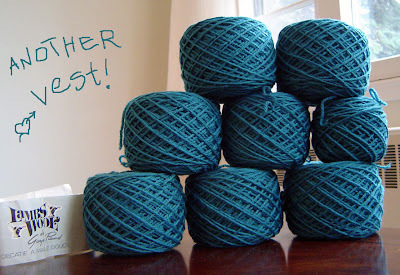 "worsted" - it's not just a weight, it's a process. Big congratulations to you! You finished with impressive speed! Love the blue - love the Mookie. He looks kind of blue/black now, juxtaposed with the yarn on your blog. Handsome. Good on you for finishing your coursework. This spring I completed my own comps, with the delighted realization that I'll never take another exam in my life - just grade other people's! Lovely yarn! Hope to see the finished vest soon.